Special thanks to Loco in Yokohama for hosting the blog matsuri. Japan is now in the middle of tsuyu season, which refers the long spell of rainy and high humidity weather in early “summer”. Things remind the Japanese of summer are for example, firework, bon, watermelon, matsuri (festival), yukata, sea bathing, somen, sound of furin and so on. 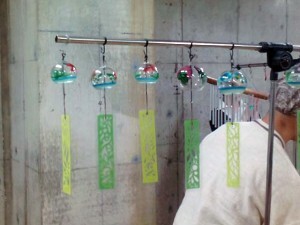 A furin is a Japanese wind chime. 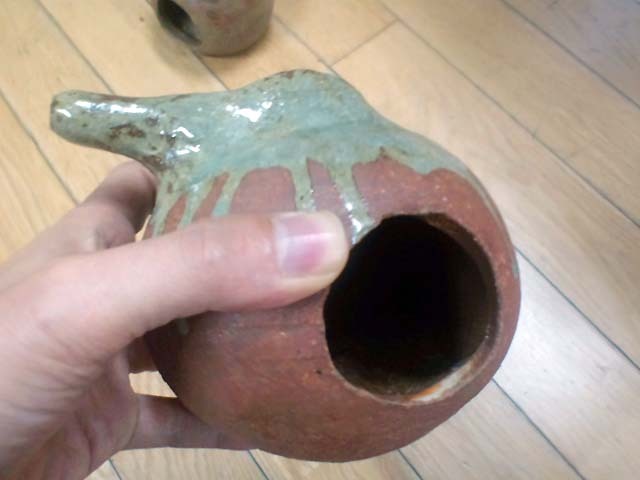 In a previous post, I introduced a Japanese furin performer in this blog last year. With the post as a start, I got interested in the performer and went to his furin concert this year. Before showing the pictures I took at the concert, I want you to see this video (it’s not the concert). 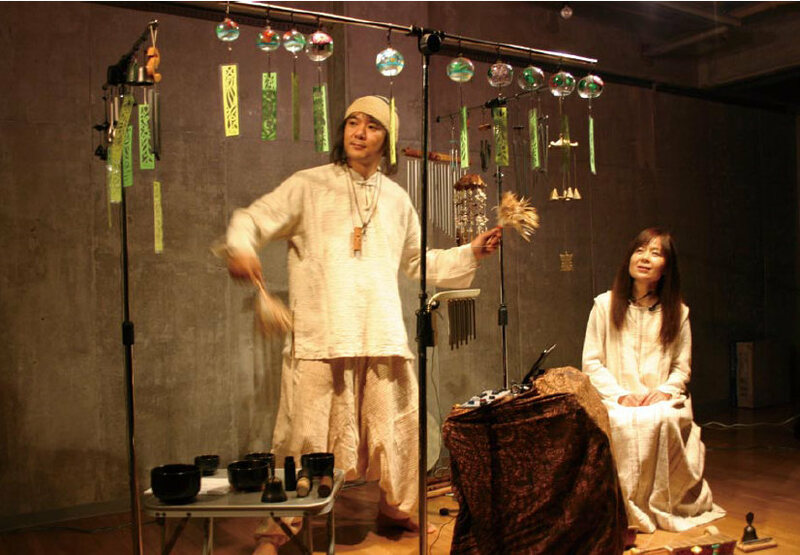 He is the furin performer, Kazaoto. With feather duster like things in his hands, he makes sound by hitting the strips. It is hard to tell through the picture but he said that he needs to adjust how hard he hits subtly and a lot of practice to master a song. These are the furin used for his performance. They look random but they are lined in musical scale order. 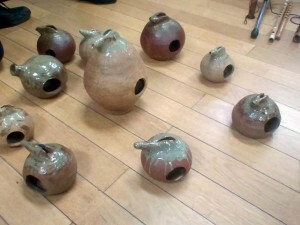 Another set of furin used for his performance. These types of furin are more common in Japan. During his performance, he uses strange flutes to entertain the audiences more. These are his cross flutes. Kazaoto was switching and playing the flutes during the concert. Yes! They are flutes too! It’s hollow and the tube on the left is where a player blows. 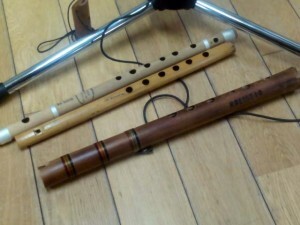 I had never seen such musical instrument! The concert was only about an hour but the soothing sound made my body and soul relaxed. 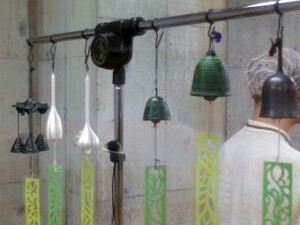 He holds furin concerts in the whole country. Sometimes he is invited to schools and covered by magazines and TV shows, so he is getting well known. Since as I already mention, furin is a summer thing in Japan, he is gets really busy especially in summer. The reason why furin is a summer thing is its “sound”; which is really refreshing and makes the listeners feel cool. That’s why it is perfect for summer. Why don’t you have one at your house for summer? It is very soothing sound and OK to be used in winter too (LOL). Well, I don’t think I’ve ever quite come across anything like this before. These instruments are totally beyond me. Great find! Thank you very much! I was very excited when I first found this artist. I went to his concert and it was great. [Special Report] I joined the Konseki-bon Tour in Tokyo !